“All aboard!” These words are music to the ears of anyone who appreciates the romantic nostalgia of a train excursion. And who wouldn’t? No other mode of transportation allows you to experience the varied landscapes of a country so intimately. Now imagine this journey with a glass of wine in hand, accompanied by hors d’oeuvres or a multi-course meal, and you have a recipe for a delicious adventure. Plus, it’s a responsible way to imbibe since you don’t have to worry about driving around wine country. From the California coast to the Deep South, through Ohio’s Cuyahoga Valley and up to Canada, each of these trains not only offers stunning scenery, but an unparalleled wine-tasting experience. 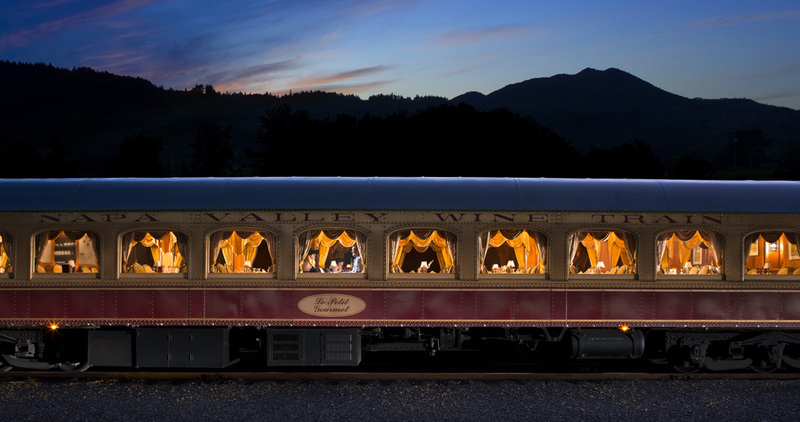 This list wouldn’t be complete without mention of Napa Valley’s finest luxury train. With its polished reputation and carefully curated menus, it’s no wonder that Napa Valley Wine Train is celebrating its 30th anniversary this year. Step back in time as you board the retro coaches that were once used on the Northern Pacific Railway, and prepare to drink and dine in splendor with a variety of different tours, from an Italian-themed Legacy tour that includes a visit to Robert Mondavi winery to an Estate tour that focuses on French winemaking traditions. Tours generally run between three to six hours, and each option includes a multiple-course lunch or dinner along with a tasting at one or more wineries. From $150 for the gourmet express lunch train; winetrain.com.